This is the area for manual disintegration testing products. Below you find an overview of our products. Please move forward to get all information about performance, accessoires, calibration tools and consumables. Our range of tablet and capsule disintegration testers meet in detail the current specifications of the most recent USP <701/2040> and EP <2.9.1/2.9.1.2> monograph. As with all of our products all instruments are manufactured with a stainless steel housing which is designed to be more GMP compliant than painted housing designs. A lot of these instruments find their place in QC and IPC laboratories and as most of the other equipment in these areas is finished in stainless, the Pharma Test equipment certainly does not look out of place. The most basic yet cost effective instrument in the manual Disintegration Tablet Tester range which is ideal for new or limited budget installations. The PTZS conforms to all pharmacopoeia norms. Quiet, vibration free operation is a trade mark of the whole instrument range. Stroke height is fixed at 55 mm and the number of strokes set at 30 / min. 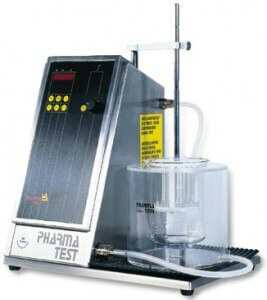 The maximum disintegration time can be pre-set and there is a digital display for the elapsed test time. The PTZS is suitable for USP <701/2040> and EP <2.9.1/2.9.1.2> configurations. The water circulation system is fully protected from overheating. The Triple Basket Disintegration Tester DIST3 operates 3 Baskets which are connected to a central stroke arm. 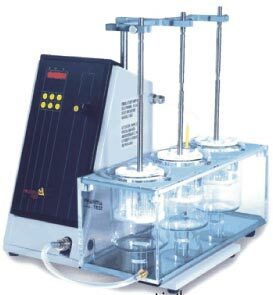 This instrument offers the most basic yet cost effective instrument in the disintegration tester range which is ideal for new or limited budget installations. The DIST3 conforms to all pharmacopoeia norms. Quiet, vibration free operation is a trade mark of the whole instrument range. Stroke height is fixed at 55 mm and the number of strokes set at 30/min. The maximum disinteration time can be pre-set and there is a digital display for the elapsed test time. The DIST3 is suitable for tablet and capslue disintegration testing as per USP<701/2040> and EP<2.9.1/2.9.1.2>. The water circulation system is fully protected from overheating. The instrument comes fully equipped, ready for use including full IQ and OQ documentation.